Most commonly, raccoons will reside in either your home’s chimney or attic; typically raccoons start their home invasions during the early spring. Raccoon mothers, who are pregnant, will look for a safe and secure place to deliver her babies; more times than not, your attic or chimney are her top choices! Raccoons are extremely strong and destructive; they will rip shingles of roofs, remove faulty chimney screens and caps, they will pretty much destroy anything in their site to gain access to your home. Once inside your home, the mother will designate separate spots for her nest and toilet; raccoons always defecate and urinate in the same exact spot. 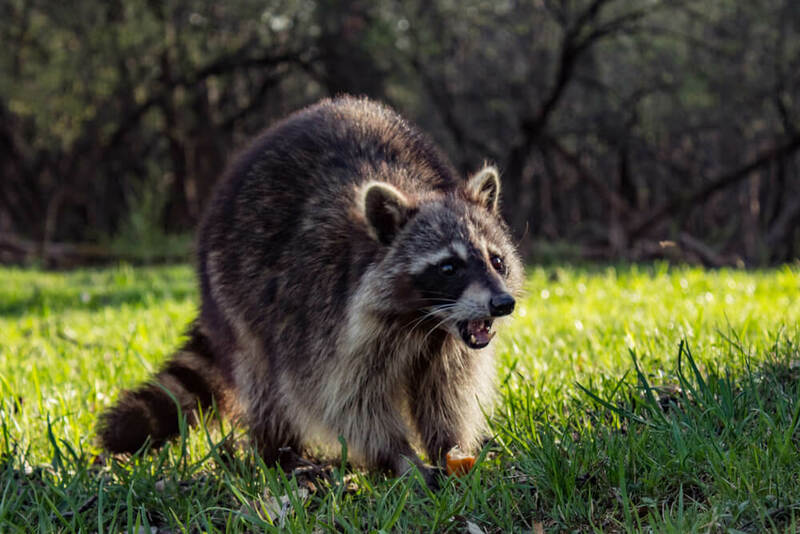 Unfortunately, raccoons do not use the toilet outside, and after a while, the smell sinks into the insulation of your home, causing an awful odor to diffuse through your home. Raccoons, by nature, are very destructive, and will destroy insulation, wires, shingles and other parts of your house. Because they are so destructive, having raccoons in your house is very dangerous for your family and your pets; please call us if there are any signs of a raccoon inside your home, it takes a professional to capture and remove these creatures! If you here chirping sounds similar to birds, chances are there is a nest of pups. You could even hear these chirping and scratching noises in your fireplace too. Look for damage on your roof, and siding along the outside of your home. If you see a raccoon on your roof or porch, chances are they are trying to get in, or they’re returning to their nest. Trapping a raccoon is the only surefire way to permanently remove it from your home. With this, we can’t block the entry point while it looks for food, the same we can do with bats; if it is separated from its babies, she will rip apart your house until she is reunited with her pups. Because of this reason, we use our humane traps to trap the adult raccoons; after we’ve trapped the adults, gathering up the pups is a lot easier. As soon as all the raccoons are carefully removed, we will begin the Raccoon Exclusion process, similar to that of bat proofing. We will securely cover and patch up any holes or entry points the raccoons previously used to invade your home. If the raccoons decided to make their home in your chimney, we will replace your old chimney cap with a stainless steel one. This “Raccoon Proofing” will help prevent any future raccoon from gaining access to your attic or chimney. As soon as we finish will the raccoon proofing, we will inspect the damages the raccoons caused while residing in your attic or chimney. We will look for feces, urine, chewed up wires/insulation, and parasites; after the inspection, based on the amount of damage the raccoons caused, we will give you an estimated quote to clean up the damage.